Indonesian special forces group Kopassus trains with the Special Air Service in Perth, according to the Australian Broadcasting Corp (ABC). 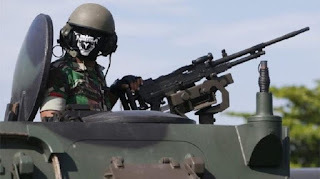 An Indonesian newspaper, Kompas, reported that a Kopassus instructor had found "laminated material" at the training facility which he considered to be offensive to the Indonesia's founding principle of Pancasila. When asked about this, Maj Gen Wuryanto said there were many reasons for the suspension, without giving further details. The official philosophical foundation of the Indonesian state. Consists of two Javanese words, originally from Sanskrit: "panca" meaning five and "sila" meaning principles. The principles are: The one God system (monotheism), just and civilised humanity, the unity of Indonesia, democracy and social justice for all. Ignoring these principles is illegal. For instance, Indonesians must hold a religion because of the first one - being an atheist is illegal in the country. The countries' navies had been expected to take part in multinational training exercises next month. "Whether or not we will continue with the joint exercise, I will have to get back to you on that," First Admiral Jonias Mozes Sipasulta, from the Indonesian navy, told the ABC. Australia has stopped conducting joint training exercises with the Kopassus before, after accusations of abuses by the unit in East Timor in 1999 in the lead-up to the former Indonesian territory's independence. The co-operation resumed in 2006 amid a renewed focus on counterterrorism after two Bali nightclubs were bombed in 2002, killing 202 people including 88 Australians. In addition to the 2013 allegations of Australian spying, ties were also strained in 2015 following Indonesia's executions of Australian drug smugglers Myuran Sukumaran and Andrew Chan, and its criticism of Australia's border protection policy. In December 2015, the nations signed a "memorandum of understanding" after Indonesia arrested nine people over an alleged terror threat following a tip-off that reportedly came from Australian Federal Police. In September last year, the first joint training exercise on Australian soil since 1995 was staged in the northern city of Darwin. In November, the nations flagged the prospect of joint military patrols in the South China Sea - something Australia already does with the US and India. Australian Foreign Minister Julie Bishop said at the time that maritime co-operation between the nations was strong and included training and personnel exchanges.